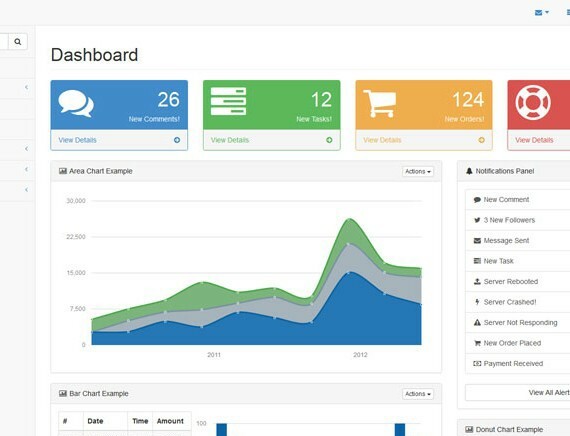 This project is a port of the famous Free Admin Bootstrap Theme SB Admin v2.0 to Laravel 5. Why is this still stuck with Laravel 5.0, when 5.4 is out? Will upgrading to Laravel 5.4 break this template? You can follow the Laravel docs for guidelines to update the Laravel version. How do i go about setting it up? I have cloned the repo and have composer and artisan installed on the server but am at a loss at how to “install” this laravel project. Can somebody throw me a link to that readme file. I have installed and see a bunch of generic charts and have no idea how to connect this to my own website. By the way, when I tried to submit this form I was forced to give a rate. How can I rate when I haven’t managed to to start it and it would be unfair to give a low rate just becase I am not as genius as the next guy? can i change laravel to 5.2. * in composer.json? You can follow the Laravel docs for that. Any helpful tutorial you know of that can facilitate the process of updating the laravel version in your project? The theme includes the readme file.You can refer that. An amazing time saver!! Thanks for this! It has just everything needed, without trying to push too hard and create a bloated panel. A perfect balance between functionality and simplicity. This is perfect for the ‘hit the ground running’ project were admin is just a function and not the core responsibility of your app. Great work well executed. It is good, can you integrate laravel 5 with AdminLTE. I am waiting your info about this. nice theme to start …. Its really helpful theme for startup admin panel usgin laravel. Well structured theme and containing all basic things.